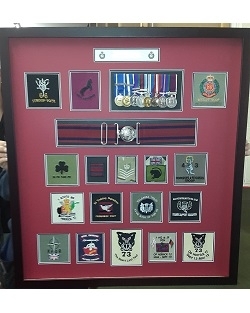 Bespoke Medal Frame tailored to your requirements. Court Mounting of Medals will incur an extra charge or alternatively go to your local Tailors direct. Please contact the Office on 01748 834488 OR email Lynne.Carter@victoriaprints.co.uk for a quote OR alternatively bring all of the items in to our shop located in Colburn.